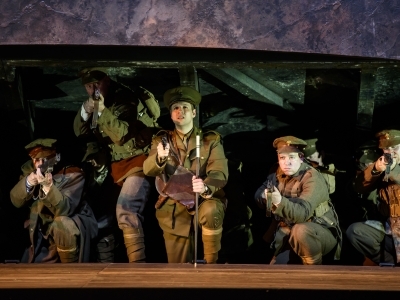 This major new opera follows Private John Ball and his comrades as they are posted to the Somme. As we mark 70 years of WNO it is a time to look forward. What better way to do this than with a world première of a major new opera? In Parenthesis is young British composer Iain Bell’s adaptation of the epic poem by Welsh poet, writer and artist David Jones. Private John Ball and his comrades in the Royal Welch Fusiliers are posted to the Somme. In Mametz Wood they enter a strange realm – outside of time, dream-like but deadly. Rather than simply reporting the horrors of the Somme, In Parenthesis dares to offer hope. Even here amongst the destruction, a fragile flowering of regeneration and re-birth can be found. Bell’s beautiful score combines traditional Welsh song with moments of other-worldliness, terror, humour and transcendence. 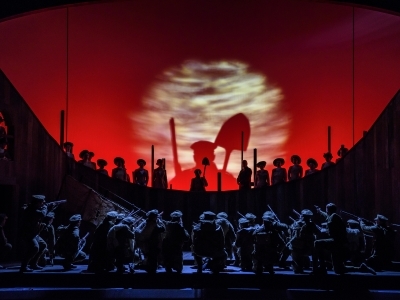 David Pountney’s period production is both an evocation and a commemoration of the events of the Somme. 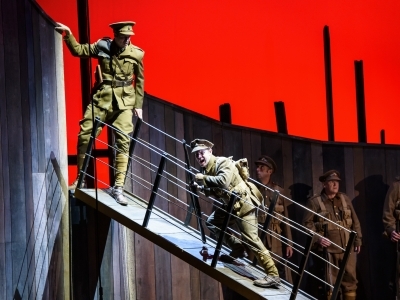 In Parenthesis was streamed on The Opera Platform at 7pm 1 July 2016. Commissioned by the Nicholas John Trust With 14-18 NOW, WWI Centenary Art Commissions, supported by the Heritage Lottery Fund and Arts Council England and by the Department for Culture Media and Sport. 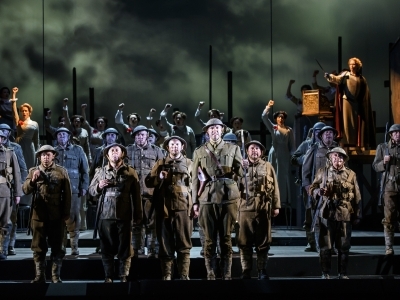 Supported by The John S Cohen Foundation, the Gwendoline and Margaret Davies Charity and WNO Commissions Group. In a place out of time, two bards – representing Britannia and Germania – and a Chorus of Remembrance contemplate ‘the many men so beautiful’ who went to war. John Ball, a young Private in the Royal Welch Fusiliers, joins the rest of his platoon on parade, and is reprimanded by Sergeant Snell and Lieutenant Jenkins for being late. Ball and his fellow soldiers – Lance Corporal Lewis, Private Watcyn, Private Wastebottom, and Dai Greatcoat – march through rain to Southampton docks. Ball experiences a number of hallucinations: in the first, his companions appear to transform into hunting dogs, and in the second, when the gangplank of their ship to France is lowered, Ball feels as though they are entering a gateway to the underworld. After a period of rest, the peace of the French countryside is shattered by the explosion of a single shell; the men's first experience of the violence of war. Ball’s hallucinatory visions persist as the men make their way to the Front Line for the first time: to him, Lieutenant Jenkins is like Christ leading his sheep through the wilderness. The Chorus of Remembrance looks on, as the platoon is met by the mud-caked Marne Sergeant. Once they have reached the Front Line, Ball and Lewis are put on watch. At dawn, the tension is broken when a German soldier sings a Christmas Carol, and the platoon responds in English. As the men enjoy their breakfast rations, the two oldest soldiers, Dai Greatcoat and the Marne Sergeant, argue about who has fought in more battles, until a barrage of shelling interrupts them. In a French café, the men are enjoying drinks served by a barmaid, Alice, but Ball feels a presentiment of death. The men receive orders to march south to the Somme that evening. As the men march to the ‘Magnetic South’, they sing a marching song, while the Chorus of Remembrance echoes the words of the ancient Welsh battle epic, Y Gododdin. From their position at the Queen's Nullah near Mametz Wood, Ball and his companion Lewis share a moment of peace, before the order comes to attack the Wood. A sudden bombardment causes Ball to have a breakdown. A shell hits Lewis, killing him instantly. At dawn, the Chorus of Dryads can be heard from within the forest. Ball and the rest of the men are ordered to advance on Mametz Wood. Jenkins is shot, and the remaining men enter the forest in disarray. The Queen of the Woods and her Dryads bring death and destruction to the forest and Ball’s comrades. Within Mametz Wood, Ball finds himself alone with the Bard of Britannia. The Wood is a place of unexpected beauty. As the battle continues, one by one, the rest of Balls’ comrades die, leaving him as the sole survivor. Ball is shot in the leg, forcing him to crawl out of the woods leaving his rifle behind. The Queen of the Woods and her Dryads garland the dead men with flowers and greenery, bringing regeneration and rebirth with their prayers.